Thank you for taking a few minutes to consult this section of our Web site. Your privacy is very important to us, and for protect it better, we give you these notes where you will find information on the type of information collected online and the various possibilities that have to intervene in the collection and use of this information on the site. This is an informative statement that, pursuant to art. 13 and 122 of Legislative Decree 196/2003 ("Privacy Code"), as well as in accordance with the General Provision of the Privacy Guarantee of May 8, 2014, VaporArt Srl, the holder of the treatment, provides users interacting with Website services www.vaporart.it (and its subdomains) some information about cookies used. 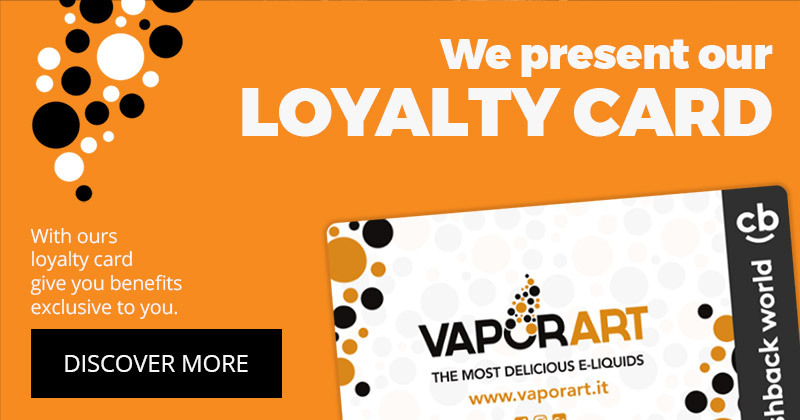 The information is made only for the site www.vaporart.it (and its subdomains) owned by VaporArt Srl and not for other websites which may be consulted by the user through links. Vaporart Srl is the data processing owner. Other people authorised to process data are those specifically authorised by CED, by the system administrator and by the administrative and commercial offices. In compliance with Art. 7 of the Leg. Decree 196/03, you have the right to request the cancellation or obstruction of the unlawfully processed data, as well as to oppose, for legitimate reasons, the processing thereof. We inform you pursuant to Section 13 of Decr. legisl. 196/03 "Code regarding the protection of personal data" that the personal data you provide at compiling our forms and sending them via the form on our website, will be processed in accordance with the legislation in question. The processing of data, which can be done through automated means and / or paper, usually include the operations of art. 4 of decr. legisl. 196/03, which are necessary in relation to the request made by you. Please note that the discolsure of these data in general it is not mandatory but the refusal to authorize the disclosure of personal data to all the above, as well as the required consensus, makes it impossible to proceed transmission of the information. Please be advised that pursuant to art. 13 of the decree. 196/03 ("Code regarding the protection of personal data") that the personal data supplied by you, or acquired as part of the contractual relationship intercurrent with you or that will be established in the future, may be treated in compliance with the legislation in question. We also inform you that with regard to the above-mentioned data, you can exercise your rights under Article 7 of Legislative Decree 196/03, and request - if necessary - the updating, rectification or integration of data erasure of data for which is no longer required to be held, the statement of the processing operations. You will also have the right to object to the processing of data if there are legitimate reasons. We point out that the disclosure of these data it is not mandatory but the refusal of treatment could make it impossible to proceed with the timely fulfillment of legal requirements and contractual obligations. A "cookie" is a small text string sent from a web server to a Web client (usually a browser: Internet Explorer, Mozilla Firefox, Google Chrome, etc.) and then sent back from the client to the server (without changes) each time the client accesses the same portion of the same web domain. There are several types of cookies. Some are needed to navigate the Site, others have different purposes to ensure internal security, administer the system, perform statistical analysis, understand which sections of the site are of interest to users or offer a personalized visit to the Site. Disabling cookies may limit your ability to use the Site and prevent from fully benefiting all the features and services on the Site. To decide what you accept and reject, it is illustrated below a description of cookies used on the Site. The website www.vaporart.it (and its subdomains) uses only technical cookies, with respect to which, pursuant to art. 122 of the Privacy Code and the Guarantor's Decision of May 8, 2014, no consent is required from the party concerned. Two technical cookies are also used to facilitate user browsing, recognizing and avoiding the appearance of an information banner with age control (clicking "yes" on the popup that appears), and short cookie information in case of site links made within the deadline (which is activated by clicking "ok" on the banner). Third-party cookies are set by a domain other than that visited by the user. If a user visits a site and a different company sends the information using that site, there are third-party cookies. Through the website www.vaporart.it (and its subdomains) are installed some third-party cookies, including profiling, which are activated by clicking "ok" on the banner and of which we enclose the details, along with links for more information. TRADEDOUBLER is a persistent cookie (first party) that sends data for the operation of CashBack at lyoness.com, and allows a detailed recording of each sale in our system. Social buttons are those special "buttons" on the site depicting icons of social networks (e.g. Facebook and Twitter) and allow browsing users to interact directly with the social platforms with a "click". The social buttons on the site are links that refer to the holder’s accounts on the social networks depicted, and therefore there are no third-party tracking cookies present. Social buttons that are instead used in the news pages and articles allow the social networks the icons concerned to capture data related to the visit. Third-party cookies are therefore installed when these buttons are used, including profiling cookies. However, the site does not share any user information or navigation data acquired through its website with social networks accessible via Social buttons. You can apply at any time by contacting the data controller by sending an e-mail to info@vaporart.it, the rights under art. 7 of Legislative Decree no. 196, which is later reported verbatim. e) the subjects or categories of persons to whom the personal data may be disclosed or who may become aware of them as designated representatives in the territory of the State, of persons in charge. c) the attestation that the operations referred to in points (a) and (b) have been made known, including their content, to those to whom the data have been communicated or disseminated, except where such fulfillment it is impossible or involves the use of means manifestly disproportionate to the protected right.